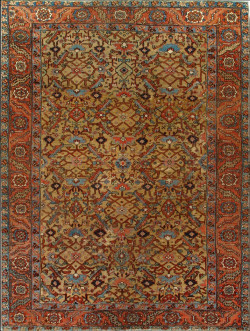 This striking and unusual antique Heriz carpet displays three rows of a rare pattern of squirrels confronting dragons, on a light camel ground. The implicit central axis is anchored by two complex palmettes and a small cruciform motif. The tall standing squirrels with long leafy tails are each menaced by diminutive dragon heads. The latter have vestigial antlers, long and curving snouts, pointed tongues, fierce fangs in gaping jaws, piercing eyes and stylized front legs. They grow from a tendril extending from a palmette. The innocent squirrels are also part of the arabesque and vine pattern. 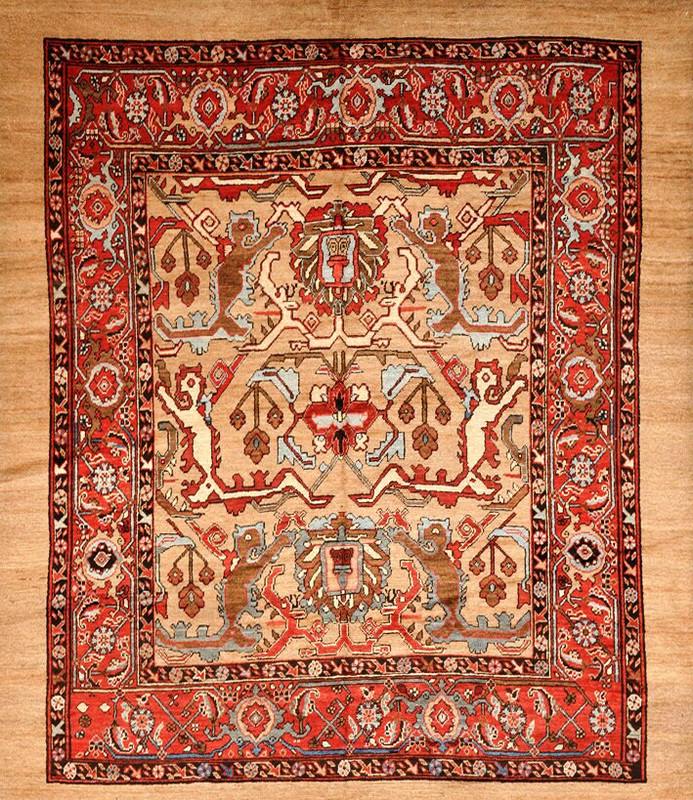 The eye catching central pair of ivory squirrels are the largest white areas in the rug. The squirrel is not native to Persia and the cartoonish dragons are not the benevolent ones of Chinese art. Both squirrels and dragons derive from the split arabesque motif. 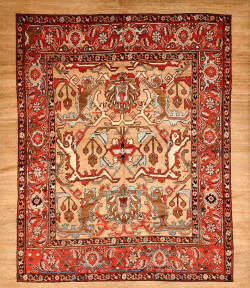 The squirrel (and dragon) pattern is extremely rare and appears only for a very short time in late 19th century Heriz rugs. 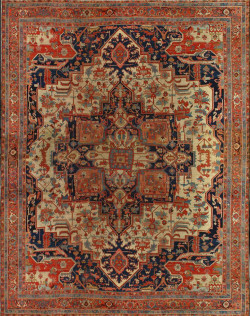 The design also appears as a border motif, but fewer than ten examples are recorded with it in either format. 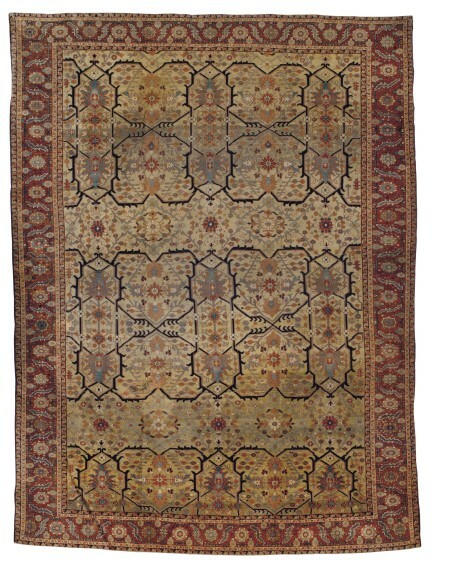 The rust ground main border is an informal version of the iconic and ever-popular ”turtle” palmette pattern. 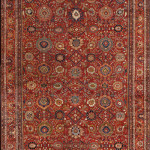 The subtly abashed light camel tone plain out of border balances the similarly colored field. 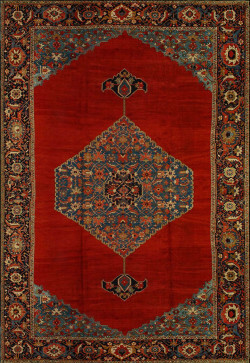 Unlike many Heriz rugs, there is very little blue. The foundation is all cotton, and the medium symmetric knotting is uniform. The pile is generally even and they are no repairs. The sides and ends are original. 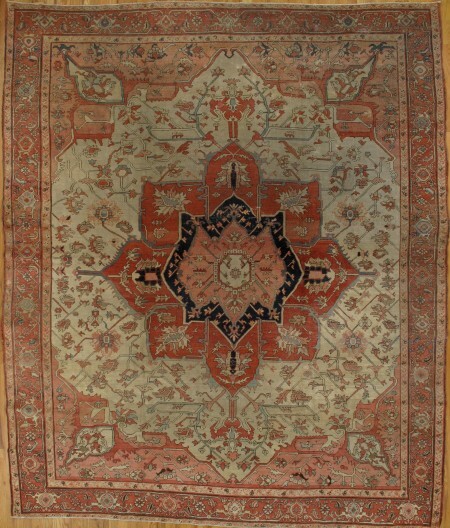 This rare antique Persian rug is equally appropriate on the floor or as a distinctive wall hanging.